Shoreline Community College musicians join the Seattle Jazz Guitar Society to entertain patrons at Caffè Musica, 14300 Greenwood Ave N, on Sunday, February 4, 2018 from 5 to 7:30pm. 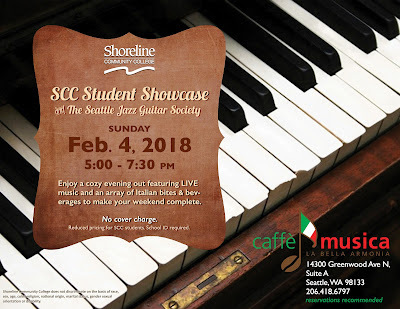 Enjoy a cozy evening out featuring smooth jazz and an array of Italian bites and beverages. No cover, but reservations required to guarantee a table, 206-418-6797. $15 menu. This open jam will feature some great guitar work accompanied by other skilled instrumentalists on bass, piano, voice, and horn. Caffè Musica is in Suite A below the Nelson Apartments on Greenwood.